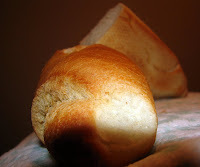 Since the invention of the sliced bread Americans were deprived of the taste, aroma, texture and pleasure of eating the real bread. Bread is not supposed to be squashy, buttering a slice of bread should not require some yellow substance (it’s not frigging butter no matter what the box says), bread should be satisfying, filling, with crispy crust and aromatic crumb. Real bread is named artisan bread now and there are several places in town where you can find it. These rolls can be purchased at China-Town Market on 3rd and Grand and they cost only 50 cents each. Look for them around the cash register. 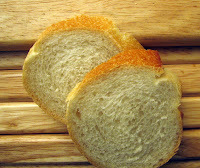 The best thing since (and long before) sliced bread – real bread. Enjoy.